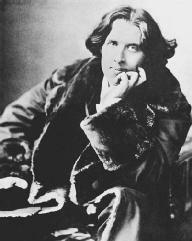 Wilde was born in Dublin, Ireland, probably on October 16, 1854, although some sources say October 15 or 1856. He was a talented writer who achieved prominence—despite mixed literary criticism—with his first effort, Poems, in 1881. Many of his subsequent works are considered classics, including the novel The Picture of Dorian Gray (1891), and the plays Lady Windermere's Fan (first produced, 1892) and The Importance of Being Earnest (first produced, 1895). Wilde's lawyers denounced the witnesses as characters of ill repute and pointed out conflicting facts in their testimonies. The trial ended in a hung jury, but Wilde was retried in May 1895. That time, Wilde was found guilty and sentenced to two years in prison. He was released from Reading Gaol (pronounced "JAIL") in May 1897 and moved to Europe, where he assumed the name Sebastian Melmoth. During his exile, he wrote "The Ballad of Reading Gaol," a long poem decrying the cruelty of British prison conditions, especially affecting child inmates. He also wrote letters to English newspapers to sway public opinion during consideration of new legislation. Most notably, on a personal and literary level, Wilde composed a letter to Douglas that was filled with recriminations against the younger man, which was published posthumously in edited form as De Profundis in 1905. Wilde died on November 30, 1900, in Paris. Foldy, Michael S. 1997. The Trials of Oscar Wilde: Deviance, Morality, and Late-Victorian Society. New Haven, Conn.: Yale Univ. Press. Great Britain. Public Record Office. 1998. Oscar Wilde: Trial and Punishment, 1895–1897. Kew, Richmond, Surrey, England: Public Record Office. "Great Trials: Oscar Wilde." 1996. Quill and Quire 62 (April). Holland, Merlin. 2003. The Real Trial of Oscar Wilde. New York: Fourth Estate.